Each escutcheon comes with a LIFETIME coating guarantee! The UAP High Security 2* Kitemarked Escutcheon with pull feature comes in 2 finishes – Mirror Polished and Satin Stainless Steel, and has been designed to colour match with the UAP pull handle in order to give perfect co-ordination to a front door. 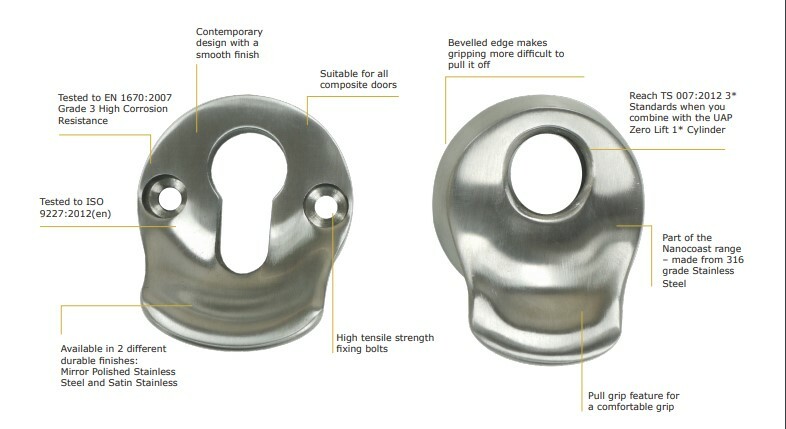 This high security escutcheon has several security features including a bevelled edge. The bevelled edge makes it extremely difficult to grip the escutcheon with pliers in order to pull it off. Another security feature are the high tensile strength fixing bolts which are designed to secure the escutcheon firmly to the door. The pull grip is simply an additional section put onto the escutcheon – designed to perfectly fit the thumb for a comfortable grip. This new feature greatly improves the functionality of the everyday escutcheon. It has been developed for user efficiency by making the operation of closing and locking the door straightforward and smoother. Each high security Kitemarked escutcheon is made from 316 grade stainless steel and is part of the UAP Nanocoast range. 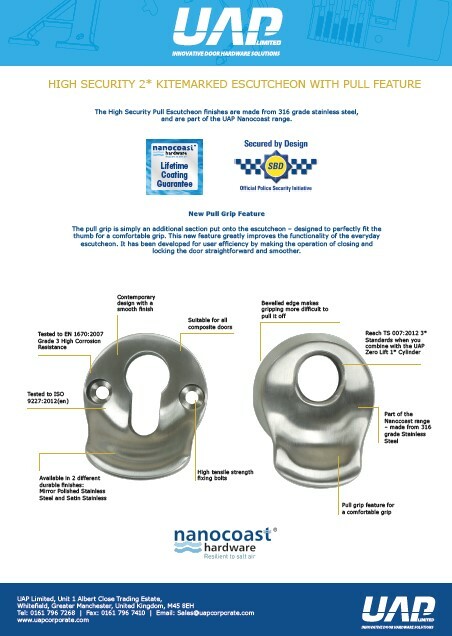 Nanocoast products are specifically designed to not pit, rust or corrode when placed in areas exposed to the elements, particularly within a 25 mile radius of the coast or within 5 miles of highly populated industrial areas. Each product has been salt spray tested to ASTM B117 for 2,000 hours and comes with a LIFETIME coating guarantee! The design of the high security escutcheon has been developed to be contemporary, and it also comes with a smooth finish to make any door look professional. It is suitable for all composite doors and hardwood doors only, and has also been tested to ISO 9227:2012! The escutcheons are ideal to be combined with the UAP+ 1* Kitemarked euro cylinders to achieve a 3 star PAS24 solution! This machine tests the corrosion resistance of the esuctcheons and many other products. The salt spray cabinet produces a corrosive environment, by releasing a dense saline fog into the chamber which the products are exposed to. This creates accelerated corrosion to the product and allows us to test how well the product would stand up in harsher environments. Stainless steel products are part of the Nanocoast range, and are salt spray tested to ASTM B117:2005 for 2,000+ hours, and we offer a lifetime coating guarantee on these products. Plywood Block Attacks were made with a small chisel, norbar (hook) and mole grips (curved) to try to lever and pull the escutcheon off for 3 minutes, but entry was not achieved. UAP Ltd distribute a wide range of 304 and 316 grade stainless steel Nanocoast products, including but not exclusive to; door knockers, letterplates, door viewers, door numerals, door handles, pull handles, escutcheons, hinges, letterplate shrouds and identity card slots. 1. The products are applied to a door, window frame or door panel and no item of door furniture on the door, window frame or door panel are sealed or fixed using any form of silicone sealant or the like. 2. The products are fixed correctly and the right way around using the correct fixings, and are not scratched or damaged at any time during the installation process or thereafter. 3. The products are cleaned with a lemon based very mild soap solution and a soft cloth once a month, or every 2 weeks in areas of high sea salt such as coastal areas. At no point should any form of cleaning agents be used. 4. No claim will be accepted for any product that is scratched or mutilated or fitted incorrectly. 5. The guarantee only applies if the hardware is fixed to the original door for which it was bought and fitted by the installer. The guarantee will cease immediately if the hardware is removed from the original door or window. 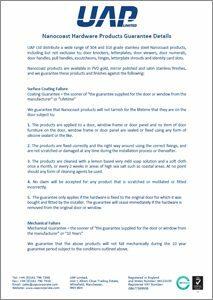 We guarantee that the above products will not fail mechanically during the 10 year guarantee period subject to the conditions outlined above.